I took a whole month and I did EatingMyWayThruPortland Cheap Eats style. Sometimes you just don’t want spend a fortune to eat out, but yet you still want good food. I know I do, so I have compiled a list from my whole month plus all the great places I had already been to. Watch for future Cheap Eats here. I will post them as soon as I find them. Let’s begin by clarifying by what I mean by Cheap Eats? I want good quality food, with a decent portion size, for under $10. You might think the only place to get this cheap fare would be at a food cart or even an “order at the counter” restaurant, but that’s not entirely true. Yes, I have listed food carts and counter service restaurants, but I have also included a wine shop. Helser’s on Alberta – When we chose to go here I had no idea how reasonably priced everything was going to be. The servings are huge, the food was good and the service was great as well. 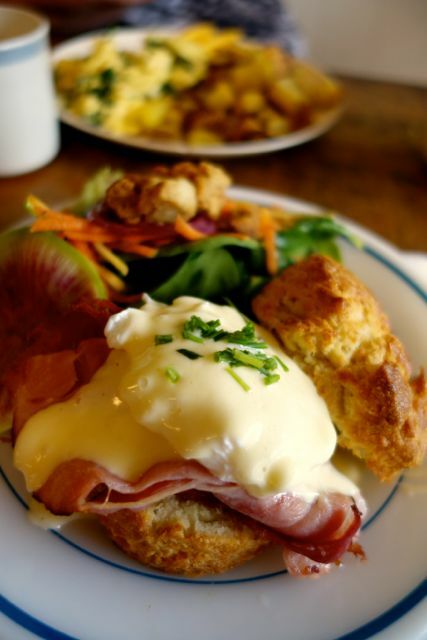 Lauretta Jean’s – Egg’s Benedict and a beautiful salad for just $9. 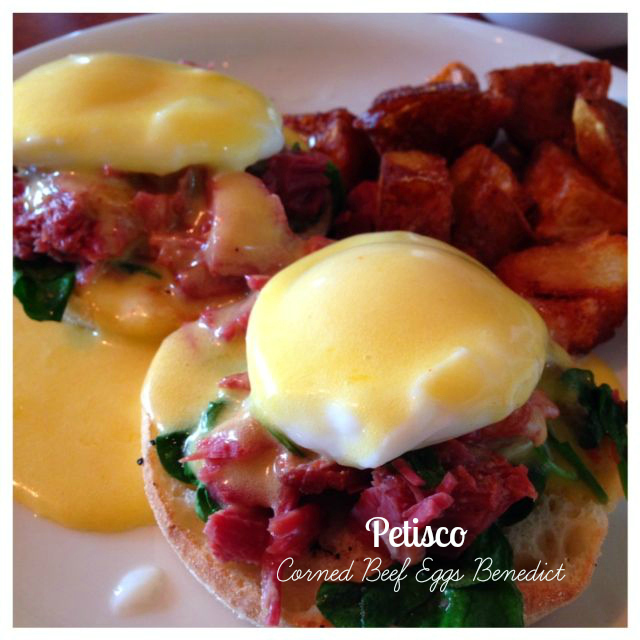 Petisco – Breakfast entrees for $7-$9. They also have sandwiches in the same price range and I hear Happy Hour has killer prices as well. Plus there is a great little patio for those sunny days. Breken’s Kitchen – The most expensive thing on the menu is $9.95, everything else is under that price. Even though this is a coffee shop, with a great breakfast and lunch menu, they also have a Happy Hour. When I was there, Lasagna was on the Happy Hour menu. Lovejoy Bakers – With breakfast sandwiches right around $6 you can grab a tea or coffee to enjoy with it and stay under $10. Plus the people watching, from the Adirondack chairs, on a summer day is mesmerizing. The Egg Carton – This is one of my favorite food carts in town. Eggs Benedict with some of the best Hollandaise sauce in town. Teote – Arepas for just $6.50 and food so good you will be going back again and again. Lela’s Bistro – My Banh Mi was the most expensive one at $7. PDX Sliders – Burgers from $3.50. They have lots of options, plus they are small enough you can choose two. When the selection is big, like this menu, I like trying more than one thing. Shut Up and Eat – Breakfast sandwiches run around $6.50. Lunch Sandwiches are $9 and big enough to share. The Italian Market – This great food cart right outside of Belmont Station has good sized sandwiches for just $8. And yes, you can take your food into Belmont Station to enjoy a beer. Cheese and Crack Snack Shop – Great shop offering some fabulous cheese and house made crackers. Presentation will knock your socks off. P’s & Q’s Market – Every single thing on the menu is under $10. Many people love their brisket sandwiches, but I will be going back for the Chickpea Sandwich. Best part is when you walk into this place, you kind of step back in time. Fried Egg I’m in Love – These are breakfast sandwiches served all day long. These boys have created some pretty amazing breakfast sandwiches if I do say so myself. 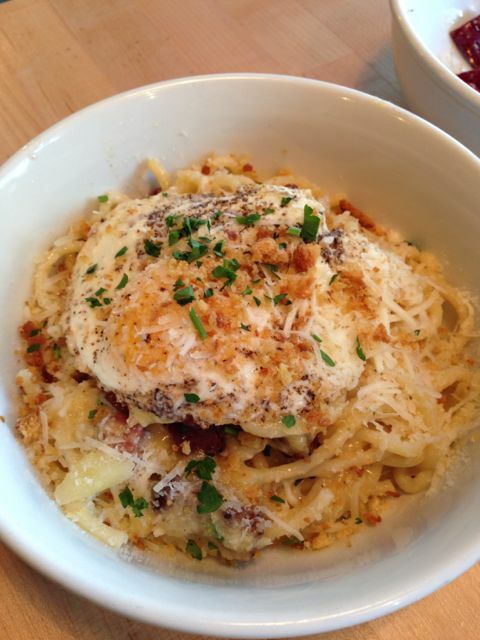 Grassa in Downtown Portland is offering house made pasta and large servings starting at $7. Oso Market + Bar – Brunch, lunch and dinner all offer many items below $10, plus they have a great wine selection. Gabagool – This is a food cart that is serving some of the best pasta in town. We have skipped the formal sit down restaurant many times to eat at Gabagool. Every.single.time it’s fantastic. He has one menu item at $10, the specials usually run around $10, but every thing else on his menu is under $10. 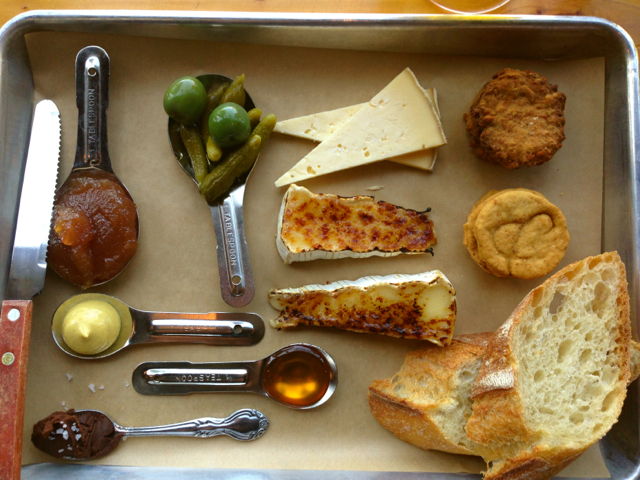 The Cheese Plate PDX – This food cart is offers cheese plates with local cheeses. Presentation here is way beyond what you would ever expect to see at a food cart. They also offer sandwiches, mac n cheese and Cheddar Ale soup in the cold months. They have tents to keep you warm when the weather is not the best, but coverings to keep the sun off. Por Que No – I love the seasonal tacos, but my husband chooses the quesadilla. They have a pretty extensive menu with cheap items yet it’s amazingly flavorful. The outdoor patio at the Hawthorne location is pretty special too. 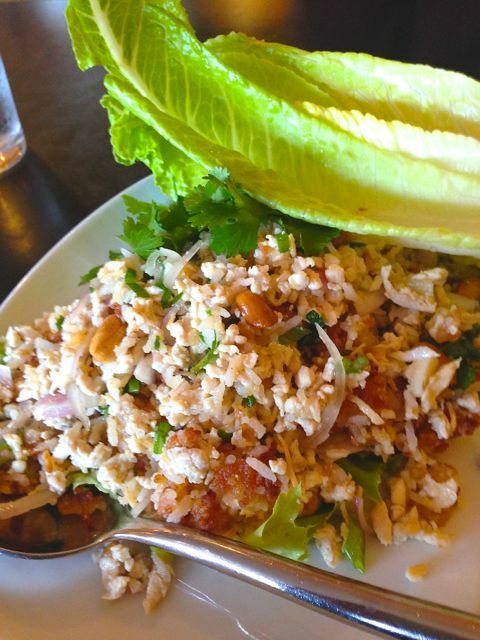 Sawatdee Thai – Dinner entrees for $8 or lunch for as little as $7. This is my favorite Thai place. Red Hills Market – They have a Roast Beef Sandwich here that is to die for, and it’s just $8.50. Thai Bloom – My heaping serving of Pad Se Ew was just $8. Another great way to enjoy Cheap Eats is Happy Hour. Grab the Happy Hour Guidebook that not only includes all the restaurants in town, but it also has coupons. Where do you go for Cheap Eats? I’ll definitely have to try these! We’re new to town, so I haven’t heard of any of them yet. If you are ever in Hillsboro, I highly recommend Manaia Coffee House and Island Grill. Their Ata plates are cheap and filling, and the Umu shredded pork is not to he missed. Your photos look so delicious! I’m on the Westside but those egg dishes are going to get me up early to travel to the Eastside soon. Yum! !